•Select Export Current View to Image from the pop-up menu. •A Save As window will display, allowing to you specify the location on your computer where the graphics file will be saved. •Select Save as image from the pop-up menu. •Select the desired image size from the Image Size combo box. 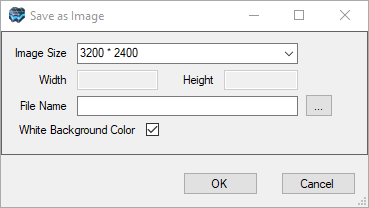 If you select Custom, then specify the desired image dimensions in the Height and Width combo boxes. •Click the [...] button and specify a folder location on your computer to save the image file. •Click the [Ok] button to save the image.